On arrival you will be met and taken to your hotel, the stylish Oliva Luxury Hotel at trendy Las Carretas neighbourhood. Take a tour of the city’s most famous sights and enjoy lunch at restaurant Cabaña Veronica in the historic Mercado del Puerto. Dine at elegant Bodega Bouza restaurant combined with a visit of the winery and an excellent wine tasting of in-house wines. Explore charming Colonia del Sacramento. This small town of cobbles, ruined forts and gorgeous flowering jasmine trees has rightly been declared a UNESCO World Heritage Site. Overnight at boutique Hotel Charco in the heart of the city, embedded in an original 1680 Portuguese house. Start the day visiting Bodega Irurtia, a family owned company since the second half of the 19th century. Besides the vineyards you will get a glimpse of Dante's winery and the Familia Irurtia museum. Taste some of Irurtias best wines, combined with local cheese and homemade bread at the wonderful oak barrels cellar. Continue to Bodega Cordano with its historic general store Almacen de la Capilla, where you feel the atmosphere of ancient times. After breakfast you are taken to Bodega Narbona. Walk through their wine cellar and enjoy one of the best Tannat wines of the region. Continue to Lavalleja province; with its Ombue woods, fields and streams it is one of the most beautiful provinces of Uruguay. You will stay at Posada de Campo Balcón del Abra, a charming small posada with eight rooms. Free day to enjoy the superb surroundings of the posada. Recommended activities: Hiking or horseback riding along beautiful nature trails, visit to the caves of Salamanca or to nearby ranches, wildlife watching. Continue to the charming province of Rocha and its beautiful La Pedrera. The best beaches of Uruguay are found in this area, powdery golden sand and stunning natural reserves. Relax at the small Boutique Hotel Las Brisas in La Pedrera´s old town in rooms, decorated with vintage design and natural fibers. Take a tour to discover one of the country’s finest and most peaceful spots. Cabo Polonio offers pristine white beaches and a menagerie of wildlife. Observe the local sea lion colony or just relax at the beach - a welcome escape from urban life. Today you will visit Bodega Garzón to witness different wines being made first-hand, extra virgin olive oils accompanied by cheese, ham, marinade, olives and homemade homemade bread. Make a lunch break at Bodega Garzón restaurant, enjoying traditional meals with fresh products. Continue to Jose Ignacio. This small village is an exclusive luxury vacation spot on the Uruguayan coast. You will spend your time at beautiful Playa Vik, South America's most exclusive small Design boutique hotel. Free time to relax at the pool overlooking the landscape, walk the endless beaches, take a walk through the countryside by a visiting naturalist, stretch out with yoga on the beach or enjoy a wonderful massage in your suite. You will head to the famous Punta del Este, Uruguay‘s most glamorous beach resort. Stop at Punta Ballena for a fantastic view on the coast, visit Casapueblo, the monumental creation designed by Uruguayan artist Carlos Páez Vilaró and take a tour of Punta del Este´s lovely sights before you return to Montevideo. Overnight at Oliva Luxury Hotel. Morning at leisure, transfer to the airport and homebound flight. 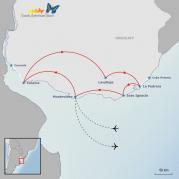 SAT offers wonderful extension programs in Uruguay and beyond!